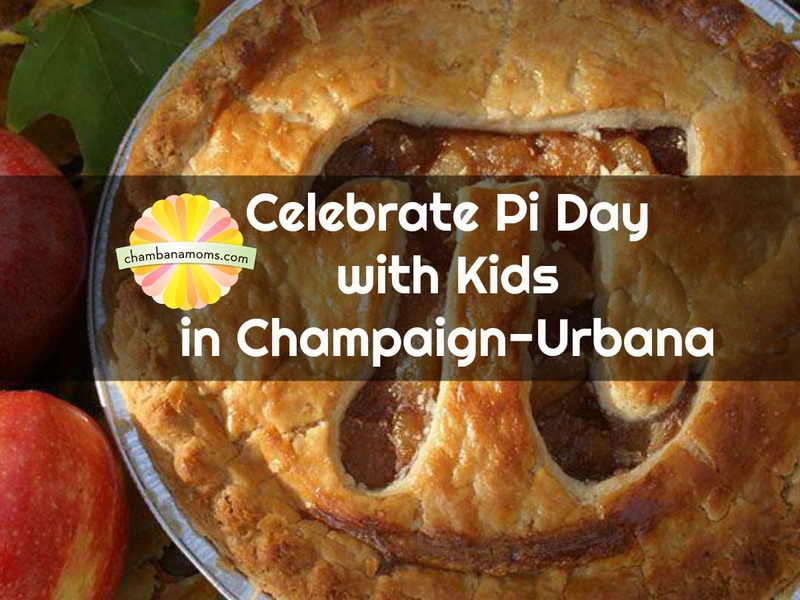 Looking for a fun Pi day celebration in Champaign-Urbana? Pi Day Open House at Makerspace Urbana is celebrating Pi day at the Independent Media Center in Urbana on Wednesday, March 14, 7:00 p.m. – 9:00 p.m. Please feel free to bring a pie! We will also supply some snacks and drinks. This is a FREE event. Want to celebrate at home? How about sharing a favorite pie together? Or, even a pizza pie! At our house we use Pi Day to celebrate all things STEM. Want more? Here are some fun ideas to start pi day traditions with your kids. Now on to some math! Quick! What are the first fifty digits of π? On March 14 (3/14), math students around Champaign- Urbana will be celebrating π Day , if not in the classroom then definitely at home. 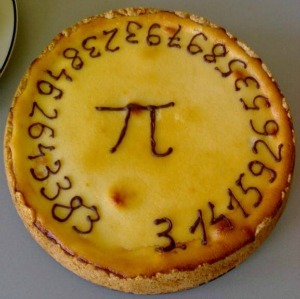 Young mathematicians typically recite as many digits of π as they can, measure the circumference to diameter ratio for round objects, sing πTunes like “American π”—and of course, eat pie at 1:59 (3/14:1:59). Celebrate math (and have a piece of pie) on pi day! Photo Credit: Wikimedia Commons. I can remember the first time I taught a series of mental math tricks on π Day to middle school students. Sharing the joys of arithmetic to a child is truly a gift. Often, students reach for their calculators to solve math problems for homework, but mental arithmetic contains its own delights. The following activities can be taught for π Day, or any math occasion. 1 is the t or d sound. 2 is the n sound. 3 is the m sound. 4 is the r sound. 5 is the l sound. 6 is the j, ch, or sh sound. 7 is the k or hard g sound. 8 is the f or v sound. 9 is the p or b sound. 0 is the z or s sound. Once this list is memorized, you can use this system to memorize the sentences: “My turtle Pancho will, my love, pick up my new mover, Ginger. My movie plays in a favorite bucket. Ship my puppy Michael to Sullivan’s backrubber.” Translating this sentence into digits will result in the first sixty digits of π. Neat! Some math students will enjoy learning mental math tricks in adding and subtracting digits of π as well. On pencil and paper, students are encouraged to add and subtract numbers from right to left. However, in mental mathematics, it is easier to add and subtract numbers from left to right. For example, to add 31 + 41, first add 40, then add 1, to get 72. Let’s try another.14 + 31 is simply 44 + 1 = 45. For numbers with carries, we can still simplify the problem by adding from left to right. For example, 41 + 59 is 91 + 9, which is 100. The same is true for three-digit numbers: 314 + 159 = 414 + 59 = 464 + 9 = 473. For subtraction, students can simplify the problem by computing from left to right. For example, 59 – 26 = 39 – 6 = 33. Some subtraction problems involve borrowing, but the strategy is the same. For example, 31 – 15 = 21 – 5 = 16. Another method is to turn the subtraction problem into addition. For example, 31 – 15 = 31 – (20 + 5) = 11 + 5 = 16. Students from grades 1-7 can have fun adding and subtracting two-digit numbers, then eventually moving to three-digit mental addition and subtraction, too. Natalya St. Clair double majored in studio art and mathematics at Scripps College. She combined her passions for both subjects to illustrate The Art of Mental Calculation. She has taught middle school math for seven years at Countryside School and has been an award-winning MATHCOUNTS coach in Illinois. She has served as a contributing member of numerous outreach programs, including the Machine Project, Illinois Geometry Laboratory, MATHCOUNTS, and the Independent Schools Association of the Central States.